I ordered the morning on Oct 30th but there was no anticipated ship date thoughout the day. After lunch on the east coast I noticed bloggers were posting photos online of lines at Microsoft Stores across the country and I read that they were being sold in stores. 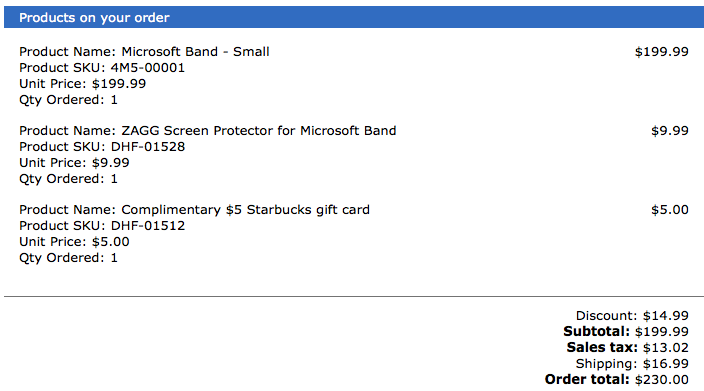 So I called the local Microsoft store when I got home from work and they had the small band in stock. I’ll be there in 30 minutes, will there be enough stock? His answer was yes, c’mon down. Upon arrival all the small bands were *not* in stock and I tried on the medium band and it was acceptable on the tightest clasp setting. It was tight enough on wrist but I could look down into the band and see gaps. 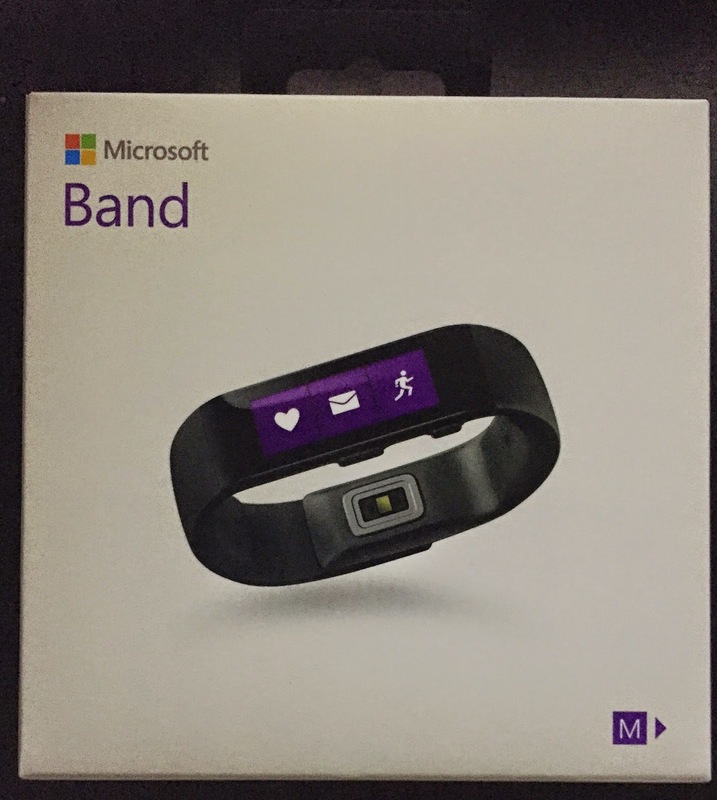 I purchased the medium band, downloaded the Microsoft Health App while the transaction and bag packing occurred and rushed back to my car to set the band up. Setup was fairly simple. I first plugged the included usb charger into my usb port in my car and to the pogo pins (mag safe-ish) on the underside of the watch and it turned on. There was typical bluetooth pairing, pins, etc. 45 seconds later it was done. I paired the band with the app and started customizing and connecting to the connected apps. I left the mall parking lot and drove home. The haptic vibration motor is *very* strong. I actually was a little started with notifications. Calendar notifications definitely get your attention. I took in a movie late in the evening and notifications discretely came in and were not obnoxious nor disturbing in a dark theater. I discretely looked down at my wrist at the notification and either manually pressed the sleep button or just turned my wrist over. I worked out after the movie and the data captured was fairly accurate. I was shocked that was was gathering estimate reps completed!. My ending heart rate was not able to be calculated. I don’t know if that was because I was sweaty or the band wasn’t tight enough with loss of water weight and/or sweat. I took the band off to shower. I watched the news and it was time for to sleep. I hit the sleep icon and action button and I was in light sleep within 6.5 minutes. What was disturbing was that I “woke up” 6 times throughout the night and my sleep was only 91% efficient. But I burn a whopping 487 calories while I sleep. Early work day. I didn’t miss a meeting because I was promptly alerted by the calendar for a pending meeting. I didn’t need to look at my phone for notifications. I could discretely see what was going on with a slight glance of my wrist. Nothing more to report here. I completed a quick workout before bed and it was very accurate. Ending heart rate was captured this time. However, the data synced to run keeper only contained duration and calories burned. Major bummer there. Shower then sleep. 95% efficient sleep with only 3 wake ups. I completed sleep tracking took the band off to shower and I forgot it on the night stand. I finished running errands and put the band on upon returning home and decided to go to Starbucks and test out the Starbucks Card QR Code Functionality and it worked. I turned the band around with the display facing out and scanned it up to the reader and boom it worked. Major win. I can now be wallet-less and now phone-less to get my Starbucks Fix! With enough caffeine I tackled a 2.5 hours and 2.30 miles in Ikea. What’s sad and disturbing is the capturing of only 320 steps in an hour. That accounted for me waiting in line and walking to my car. 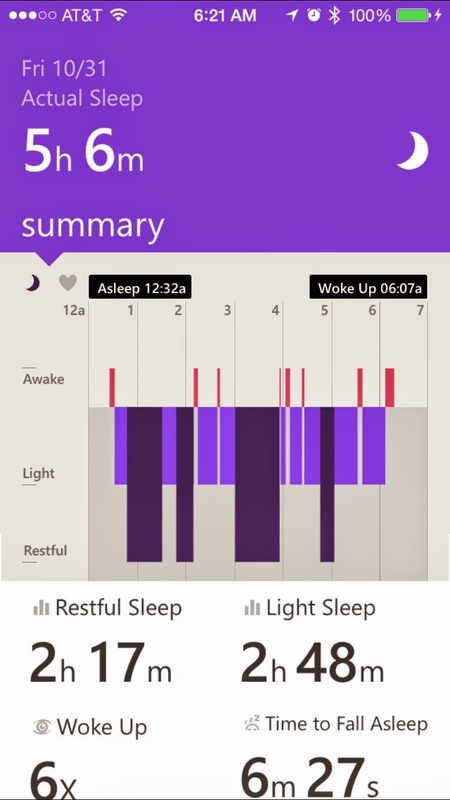 Currently I’d give the Microsoft Band a B+ or a 86/100. It got a lot right and some minor things wrong. By now if it was a dud I would have taken the thing off and banished it to the junk drawer but I’m still wearing it and hoping for great things from the device. The time before the Apple Watch comes out it critical for Microsoft. If they can add some polish to the UI and sync apps. It could be a great Apple Watch contender. HealthKit Integration is done by syncing workout duration currently and it might trickle into Healtkit. I have Runkeeper and MyFitnessPal connectivity setup and not all the activity data is being synced. I can manually enter the active calories burned but it’s a pain. 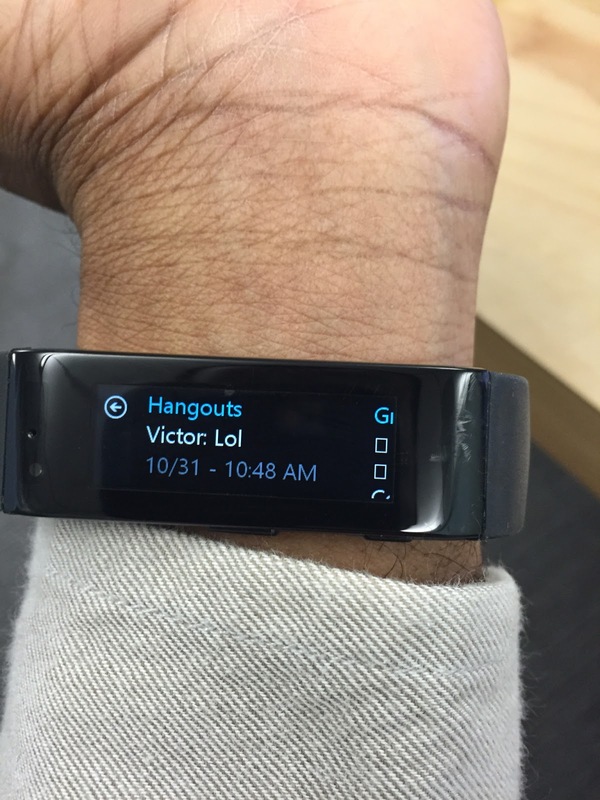 You cannot currently use the Microsoft Band as an external heart rate monitor using MyFitnessPal. I do have a Small Band Coming in the mail sometime next week. So the fit issues might be resolved come Wednesday. Supposedly HealthKit Integration is coming but it should have been there on day one.